Hayden Geraghty (9), from Limavady, Derry, has autism and didn't speak his first words until he was three. "The magazine approached us about three years ago about using a photograph. They couldn’t believe how intelligent he is and his knowledge of space," Caroline, who also writes for the magazine, told Independent.ie. "Sometimes kids will send in a picture and Hayden will describe it. If we went and did something to do with space, Hayden might come and join me at report on it. "The feedback he’s been getting is so good. It’s going really, really well. We get letters from families who are interested in where he’s going to go next. He’s really inspiring other people too. "He would love to go to the moon or mars. He said to me the other day, ‘I could go to space and I could still report for the magazine, Mam'." Hayden hit headlines last year after he became the inspiration for the world's first doll with autism. "Hayden always wears ear defenders [for noise sensitivity] and his signature space suit, so the doll is wearing that and it’s going to be released in around 30 countries around the world," Caroline said. "Autism isn’t always visible and different children are different on the spectrum, the Lottie doll teaches this to the kids. It’s inspired by Hayden, his journey and his story." 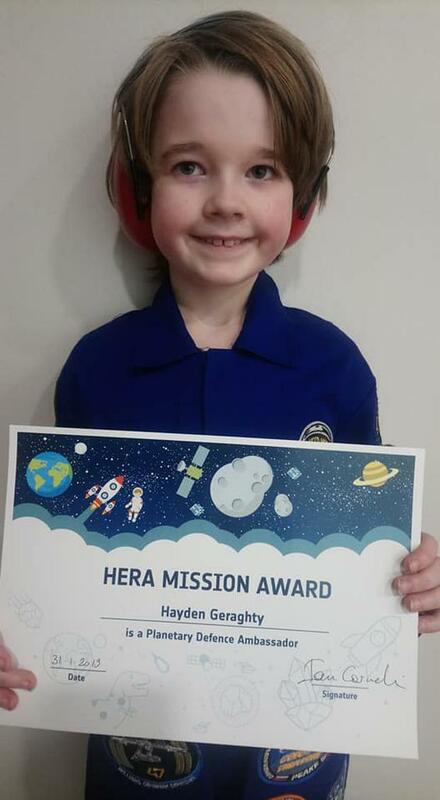 "Hayden started taking a real passionate interest in asteroids and space rocks. He is fascinated learning about the different space agencies. "We went to Madrid for four days. They gave Hayden a tour around of all of the operations and showed him what was going on there. Hayden was absolutely fascinated. You could just see the passion his eyes. He was asking them all of these questions. "They were so impressed with his passion and his knowledge and his want to inspire others that they gave him the award ‘planetary defence ambassador’ in Madrid." "It’s fascinating to see a wee boy, the great potential he has," Caroline said. "We’ve just found this one thing and it has led to an incredible, incredible journey. "Before he started to speak, he learned, that’s the moon, that’s Jupiter, that’s mars; but it’s really changed him knowing what’s going on. "Hayden was diagnosed with as being autistic aged five. He was virtually non-verbal until the astronaut Tim Peak launched to space in December 2015," she continued. "He was always trying to communicate and he’d say the odd word but we relied on communication cards to interact with him. "It was always very frustrating for him. He was always trying to connect. He had an interest in space before, but for Peake's launch, he was so absorbed just watching the broadcast. "In the build-up, he just started doing this countdown and he shouted blast-off at the television. It just took that one wee thing. I could not believe it. "I always describe it as a light bulb switching on. It just took that one thing to spark that connection. Throughout the day he kept saying it over and over and over." His mum said; "It was very hard up until then to understand what he was even all about. What he was even interested in, because we were always trying to guess, and then we saw this and it just grew and grew and grew. "Ever since then he’s talked non-stop. His love of space has just grown and increased since then. He’s developed a really intense passion for space exploration and astronomy."